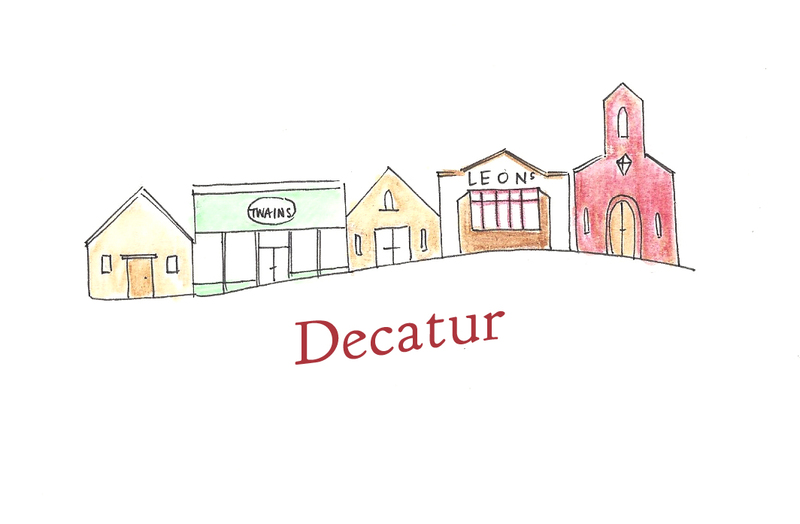 Today's ATL LOVE post takes us on a tour of Decatur Georgia! Our tour guide is Patty Catalano, my colleague and good friend. Patty was sort of the catalyst for this series, because she is expecting her first child and will be out of the office for maternity leave this month. I'm happily taking on extra work during this very special time! Patty is our Culinary Researcher, a loyal Bulldog fan, and a lover of maple syrup. UPDATED: Patty and her husband welcomed Lucy Grace into the world yesterday! Congratulations Patty and Vince! What you love about your hood: I love North Decatur for a lot of reasons: it is where my husband and I bought our first house, it is easily accessible (just a half mile or so and I'd be OTP...phew, just made it), it is close to good restaurants and grocery shopping (as you'll see below), it is close enough to downtown Decatur that I can pretend I'm part of that special club (yeah, that's me sneaking in to a Decatur resident only dog park), and it is close to Stone Mountain (I love it for the trails, not the Lasershow Spectacular). Favorite breakfast/brunch: Though my go-to breakfast spot is Goldberg's Bagel in Toco Hills (cinnamon raisin bagel double toasted with cream cheese, thank you), the best breakfast spot in my neighborhood has got to be No. 246 in downtown Decatur. My sister and I stopped in for brunch one weekend just after I found out I was pregnant, so naturally we ordered one of everything off of the menu. I spent the next few weeks...ok, months...thinking about the thick, gooey yet crispy French Toast. Yum. Favorite coffee stop: There's no question about this one: I love Dancing Goats. It is right in the heart of downtown Decatur, serves great coffee and snacks, and has plenty of seating both inside and out. Bonus: there's a Little Free Library just outside the front door. Best date night bet: My husband, Vince, and I aren't too fancy when it comes to date nights, and for that reason we usually end up at Sushi Avenue on the Square. Best meeting friends for drinks: Twain's is the spot if you want grab a beer and seat (if the beer is more important than the seat, you should head over to Brick Store Pub in the Square). I've yet to try the Pinewood Tippling Room, but I've heard they serve fantastic cocktails. It is at the top of my list once I have this baby! Diner, greasy, spoon or grab and to-go dinner: Can't choose just one. I love Community Q - they've got great BBQ, mac & cheese, and lemonade. Monterrey's Mexican Restaurant on LaVista Road wouldn't be anything to write home to mom about as it serves your standard Tex-Mex fare, but Vince and I are regulars there and have struck up a friendship with one of the waiters. If you find yourself in the neighborhood and in the need of a taco, head on in and ask for Jacob. Neighborhood Shop or Farmer’s Market: This one is tough, because I'm pretty lucky to equi-distant from both Your Dekalb Farmer's Market and Buford Highway Farmers Market. I have a love/hate relationship with YDFM, and if you have ever been there on a weekend or heaven forbid the week of Thanksgiving (somehow I always do and barely make it out alive) you know that there are a few ground rules. #1: Go in with a game plan #2: Don't be that fool with a shopping cart. Use a basket. If you have too much for a basket, bring a buddy, divide, and conquer and #3: There is no such thing as keep to your right. Still you can't beat it for some things, especially spices. Buford Highway Farmer's Market is AH-MAZING. If you love food and haven't been, you need to spend a Saturday wandering around. Compared to YDFM, Buford Highway Farmer's Market is cleaner, has greater variety, and is much less hectic--plus it is just plain fun to wander the aisles (arranged by country) and see Turkish cotton candy, fresh tortillas (yes---I'm talking fresh as in made in-house), a thousand types of Asian noodles, and locally made Georgia olive oil and cheeses. I do want to throw in one more farmer's market that I've been obsessed with this summer, and that is Sherry's Produce Stand on Lawrenceville Highway in Tucker. They have great quality produce (I may have cleaned them out of figs and corn on more than one occasion this summer), fresh flowers, and vintage sodas. The folks that run the place are really nice and the prices are very reasonable. Non-food shopping: KudzuAntique Market has got everything from vintage clothes to garden art, tchotchkes, records, and retro home furnishings. Many thanks to the talented Natalie Kilgore, who's incredible hand draw illustrations really tie the series together. You can purchase her work in her etsy shop, Natty Michelle Paperie or follow her blog, Natty Michelle, for her insightful "free-lance ladies" series or peeks into her charming home. Love it! Leon's Full Service is my go to spot..